Berte Caroline Pedersdatter was born at Benerud in Eidsvoll, Norway, daughter of Peder Pettersen and Anne Soffie Jonsdatter. She was baptized and confinned in the Eidsvoll Church and attended realskole at Eidsvoll. 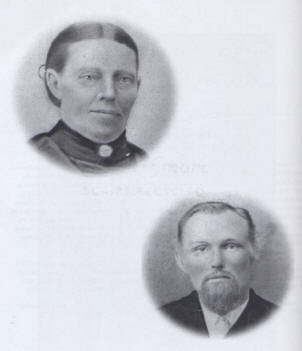 On May 7, 1867 she and Lars Anderson (Engen) were married and came to America on their honeymoon. The sailing vessel took three months to make the trip. When they arrived at Sparta, WI they had one dollar between them. Lars went to work as a farm hand and Lena as a dishwasher in a hotel. In 1871 they purchased land near Portland Center, and they farmed there a few years. In March 1876 the farm was sold and they lived in Sparta until 1877 , when they moved to Ventura, IA, where they farmed and lived out their lives. Lena and Lars had nine children: (Paul) Albert (1870-1906); Matilda, Mrs. Charles Halverson (1873-1932); Ann Sophie (1875-1966); (Carl) Oscar (1878-1969); Clara (1881-1980); Elmer (1885-1947); Conrad (1886-1980); Otto (1889-1913); and Emma (1892-1934). This family tour starts in the town of Ventura where many of our ancestors lived, shopped, and socialized. More than 50 of them graduated from Ventura High School. After the Ellington Prairie Lutheran Church burned in the 60s, some of the Andersons attended Redeemer Lutheran Church in Ventura, some attended Faith Lutheran Church in Miller, and some attended St. John’s Lutheran Church, rural Garner. The Ellington Prairie church records are held at the Faith Lutheran Church. Enjoy the sites at your leisure and relive the memories. Be sure to pull off to the side of the road when stopping and watch for traffic coming up from behind. Redeemer Lutheran Church – 301 S. Main Street, Ventura, IA. Ventura High School – 110 S. Main Street, Ventura, IA. Sophie and Ed Olson’s home – 101 E. Lake Street, Ventura, IA. Conrad and Cora Anderson’s home – 6 N. Main Street, Ventura, IA. Also, to the east of this home at the intersection of Ventura and Nelson Streets is the original house that Conrad and Cora first occupied out on the south half of Lars’ and Lena’s 240 acres. It has a deck on the front of it. Conrad and Cora’s homeplace – 2735 Apple Avenue. (This is the south half of Lars’ and Lena’s original 240 acres.) Conrad and Cora lived with Elmer, Bertha, and Lena for four years and then moved to this location in 1918. The original house was moved into Ventura and the current house was built in 1926 by Conrad and Cora. Their son, Roy, and his wife, Beverly, moved there when Conrad moved into town and now Roy’s son, Dale, and his wife, Judy, live there. Dale’s brother, Carl, lives east of there at 2708 – 270th Street. Lars’ and Lena’s homeplace—a Century Farm—2765 Apple Avenue. Lena lived there with her son, Elmer, and his wife, Bertha, until her death in 1935. Elmer’s son, Robert Norman (Norm), then lived there with his wife, Dorothy, and now their son, Bob, and his wife, Josie, live there. Elmer and Bertha also had several other family members and their children live with them over the years. Paul Albert and Emma Anderson’s home and farmland before moving to Kensett in 1901 – 280th & Balsam Avenue. 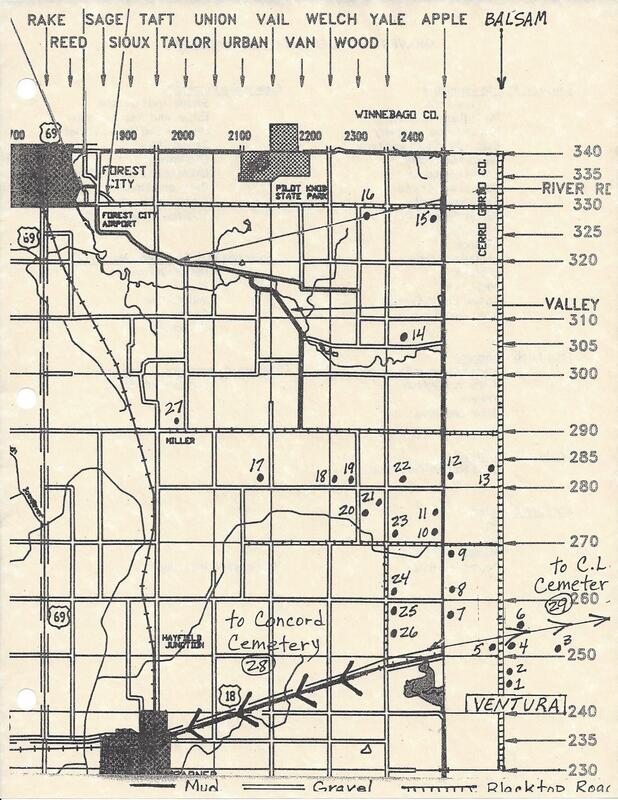 In 1900 they purchased an additional 80 acres (East ½ NW ¼) in the same section they lived in. Otto and Geneva Anderson’s homeplace – 2445 305th Street. Pilot Knob Lutheran Church and Cemetery – 2391 – 330th Street (original church was on the south side of the road by cemetery). Earl and Vivian Anderson’s homeplace – NW corner of 280th Street & Vail Avenue. Ellington Prairie Cemetery – north side of 280th Street west of church location. Ellington Prairie Lutheran Church (Norwegian) site – NW corner of 280th Street & Wood Avenue. Sophie and Ed Olson’s homeplace – south of 280th Street on Wood Avenue on east side of road (no house now). Emmett and Luella Olson moved there when they got married in 1927. Ardith and Ed Furness’ homeplace – SW corner of 280th Street and Yale Avenue (2785 Yale Avenue). Their son, Roger, now lives there and farms the land as well as Ed and Sophie’s farmland. Nordahl and Irene Anderson’s homeplace – NE corner of 280th Street and Yale Avenue. Concord Country School #1 – NE corner of 270th Street & Yale Avenue. The majority of the Andersons attended this school. St. John’s Lutheran School – corner of 260th Street & Yale Avenue. St. John’s Lutheran Church (German) – corner of 260th Street & Yale Avenue. St. John’s Cemetery – south of church on Yale Avenue. Faith Lutheran Church, 1985 – 290th Street, Miller, IA. 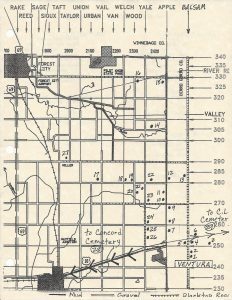 Concord Cemetery, Garner, IA – go west on Hwy. 18 to Garner; at stoplight on Hwy. 18, turn left (south) onto State Street; head south through town until you get to Lyon Street, turn left (east) and travel to the cemetery at E. Lyon & Seymour – on your right (south). Carrie and Bernard Greiman’s homeplace is southwest of Garner at 2065 Quincy Avenue where Carrie still lives there. Clear Lake Cemetery, 1715 Seventh Ave. North, Clear Lake, IA – head east to Clear Lake on Hwy. 18 until you reach the stoplight at North 20th Street (almost to I-35; west side of Best Western); turn right (south), cross railroad tracks and the cemetery entrance will be on your right (west). Country schools were established in the 1870s as well as the first school in Ventura. All eight of Lars’ and Lena’s children attended country school at Concord School #1. The school was located diagonally across the section from their homeplace. The first school in Ventura was located one mile north of town. Eventually, it was moved into town and used until it would no longer accommodate all the students. School was then held in a building owned by Gus Zobel until a two-story brick school was built in 1916. In 1917 consolidation brought about the need for a larger building. Construction began in 1918 and, while it was being built, school was held in a few different places including the Evangelical United Brethren Church. Students attended from 32 sections of land in Cerro Gordo and Hancock Counties—200 pupils and 9 teachers. Also constructed in 1918 was a horse barn for the horses that pulled the school buses. In the spring and fall, the bus was placed on running gear; in the winter it was mounted on runners with a kerosene heater inside. In 1939 a new gymnasium was added to the Ventura School. Lois and Ardith (1939-40) and Earl, Norman, and Lester (1928) were all involved in basketball. Lois and Ardith (1937) were also in band and Bing Anderson (1937) was active in the drum corps. Over 50 members of the Anderson family have graduated from Ventura High School. Other Anderson cousins attended Garner High School. The first school building held all grades, but as the enrollment increased, a new building was constructed to hold the high school. It was completed around 1917, and 14 teachers were employed for 365 students. The old building then became the elementary school. Lula Anderson Julsen was active in basketball and other extracurricular activities there. Matilda attended, and graduated, from college in Garner in 1891 [most probably the Garner Academy, later the Northern Iowa Normal College and Business Institute (N.I.N.C. and B.I.)]. It was first located north of the Carnegie Library on main street. In 1889 the college offered three 12-week terms during the year and 8 weeks in the summer. Courses were especially for teachers. Also in 1889, the first issue of the “Northern Iowa Teacher,” academy newspaper, was published. Within a couple years, more courses were added: a two-year teacher’s course; a three-year scientific course; a three-term commercial course; a two-term shorthand course; and a three-term music course. A boarding house was operated across the street where the Avery Theatre sits presently. Room and board cost $2 a week per student. Matilda then taught school at Garner until 1894 when she got married. Ellington Prairie Lutheran Church was established in 1877-78. Lars was a founding member of the church. The parishioners met in private homes for several years and then in 1885 a church was built. It was known as the “Norwegian Lutheran Church.” A good portion of the church records are in Norwegian. Most of the Anderson children were baptized, confirmed and married there. They also attended Bible school which was held all day long for three to four weeks in the summer. Many of the women of the church participated in the Ladies Aid (see separate article). In 1928 the church celebrated its golden jubilee. George Hall and Conrad Anderson were on the anniversary committee. George’s family had moved to this area from Illinois where the population was made up of mixed races. George’s mother, Carrie, was not fond of that nor the fact that many did not attend a place of worship. Carrie was said to be quite pleased with their move to Iowa because now the church was less than a mile away. In Illinois it was a 15-mile trip. Two of George’s sisters married Anderson brothers: Bertha and Elmer and Cora and Conrad. On the evening of January 6, 1965, fire destroyed the Ellington Prairie Church including a new piano and nearly-new pipe organ. Thereafter, the members of the Ellington Prairie Lutheran Church joined the members of the Miller Lutheran Church and agreed to call the church the Faith Lutheran Church. Faith Lutheran is still in operation today and holds the early records of Ellington Prairie. At the same time the Ellington Prairie Church was being established, German immigrants in the southern portion of Concord Township were forming a “German Lutheran Church.” Their membership also met in homes and schoolhouses until January of 1887 when organizational papers were drawn up. The church was built in 1892 a couple miles south of the Ellington Prairie Lutheran Church. By 1898 the congregation had grown to the extent a new church building was needed and then the old building was used for their parochial school. Some of the Anderson descendants still attend Faith Lutheran and St. John’s Lutheran as well as Redeemer Lutheran in Ventura and Pilot Knob Lutheran of rural Forest City. Oscar and Emma’s grandson, Orville, was ordained at Pilot Knob Lutheran in 1970.